For age-restricted, maintenance-free apartment living in Fairview, Texas, active adults need look no further than Overture Fairview. This 55+ community consists of 195 apartment homes with plenty of desirable amenities and an array of lifestyle and social options. With the community's ideal location, residents can easily access nearby entertainment, eateries, and everyday conveniences. 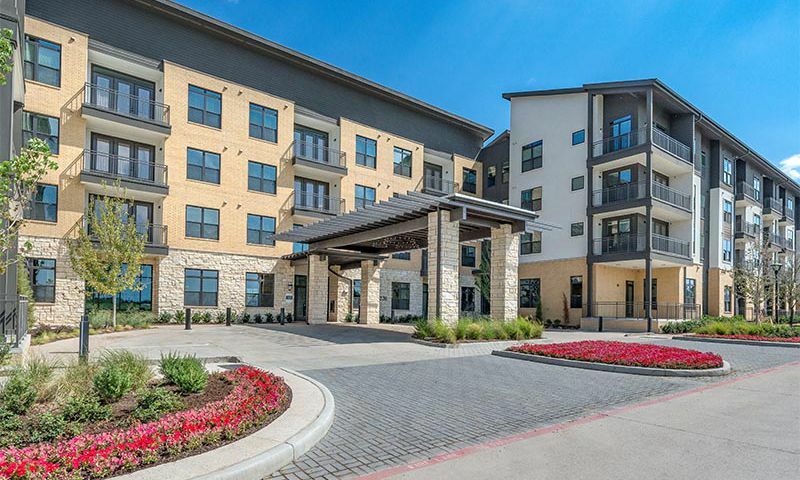 Active adults seeking 55+ apartments for rent in Fairview, TX may feel impressed to learn all that Overture Fairview provides for its residents. Overture Fairview boasts 13,000 square feet of amenity space, creating a spacious environment for residents to stay socially and physically active. Many active adults may think that world-class amenities can only be found at communities with single-family homes, but Overture Fairview allows residents to rent and still use some of the most popular resort-style amenities. Residents of Overture Fairview welcome the convenience of grabbing a bite to eat at the community's bistro cafe. For sit-down meals, residents make use of the large dining area. A private dining room is even available for hosting meals with friends. The large dining area can convert into a meeting room ideal for community events and gatherings. At the demonstration kitchen, residents can prepare meals of their own and learn new cooking skills. In the game room and the theater, residents can participate in more activities and meet more neighbors. For those who get to need some work done, there’s a business center. And with an on-site hair salon and nail salon, residents can easily access this service. Active residents can meet up at the fitness center and yoga studio to use exercise equipment and take regular classes. Or, they can head outside to use the pool, hot tub, barbecue grill, and walking trails. A dog park and dog wash inside the community are great amenities for any residents with dogs. Overture Fairview features 195 apartment homes that range between 635 and 1,325 square feet. These one-bedroom and two-bedroom residences feature wood-style plank flooring, crown molding, and nine-foot ceilings. With a variety of floor plans available, residents can rent the apartment that best suits their needs and preferences. In the kitchens, residents can expect granite countertops, prep islands, custom glass-paneled wood cabinetry, and glass-tiled backsplashes. The bedrooms include plush carpeting and ceiling fans, while the bathrooms include garden tubs and showers. Other amenities found in each residence include a full-size top load washer and dryer as well as private balconies and patios to give residents an indoor-outdoor connection. Additional storage space is also available. Residents at Overture Fairview can participate in as many activities, social events, and clubs as they want. The community provides ample opportunities to meet neighbors, make friends, and explore hobbies. Between social hours for residents and “yappy hours” for residents and their pets, socialization and fun are central to the living experience at Overture Fairview. Exercise classes include Zumba, Tai Chi, Wii fitness training, and water aerobics. Cooking classes are a fun way to get social in the kitchen and learn how to cook a new meal. Social events planned regularly include movie nights, game nights, potlucks, and holiday parties. Residents also enjoy crafting parties and book club. Neighbors can even travel to the surrounding area together with community-organized trips to sports games and local attractions. Along with fun activities, Overture Fairview supports a variety of ways for residents to improve their mental agility and continue learning. Educational opportunities include safety seminars, nutritional classes, and wellness education. Fun courses include computer and software classes, history courses, ancestry research, and writing classes. Overture Fairview is located in Fairview, Texas close to Highway 121 and Highway 75, which means that there are plenty of convenient transportation routes and options nearby. Residents can drive or use public transportation to try out all of the different restaurants and activities in the area. The community even partners with Lyft to help transport residents where they want to go. When residents want to head to the big city, they’re just 15 minutes from Plano and 30 minutes from Dallas. There are plenty of grocery stores and shopping centers just down the road, including Whole Foods Market, Trader Joe's, and Walgreens. The community is also located within close proximity to Macy’s, Allen Premium Outlets, and The Village at Fairviews, making it something of a shopper’s paradise. The nearby food options include Gloria’s Latin Cuisine, Twisted Root Burger, Wild Salsa, and Zoe’s Kitchen. When residents need health care, the community is just a couple miles to multiple facilities, such as Medical City Mckinney and Texas Health Presbyterian Hospital. Those looking to get out for some fun can head to nearby Allen Senior Recreation Center for more activities. They can also watch the latest releases at the Cinemark Allen 16. Golfers can try out Topgolf for a virtual game. There are plenty of activities available in Overture Fairview. Here is a sample of some of the clubs, activities and classes offered here. Overture Fairview consists of 195 apartment homes that range between 635 and 1,325 square feet. The one-bedroom and two-bedroom residences feature wood-style plank flooring, crown molding, and nine-foot ceilings. Want to learn more about Overture Fairview?